They don't ship to Massachusetts, but the deal on Wines 'Til Sold Out today is a pretty good one. 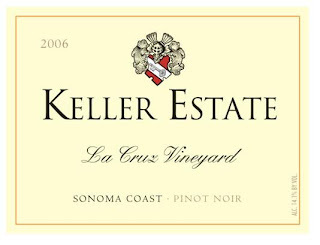 They're offering the 2006 Keller Estate La Cruz Vineyard Pinot Noir at $19.49. I visited Keller Estate in Petaluma, CA this spring. Nice place. I sought them out because Ryan Zepaltas sourced the grapes for his 95-point 2005 from this exact vineyard. I just cracked open a 2004 Keller Estate La Cruz Pinot to remind myself what the wine is all about. It's a restrained expression of Sonoma Coast Pinot Noir, full of flavor but not overbearing. Medium-body, medium-acidity, and classic Pinot Noir fruit on the nose. Not a lot of earth, but then again, I haven't found Sonoma Pinot Noirs to ever offer a lot of earth. Nice elegant stuff. I recently had the 2005 vintage of this wine poured by the glass at A.R. Valentien at The Lodge at Torrey Pines in La Jolla, CA. I think it was $16 per glass. Steep, but showing quite nicely and I enjoyed it very much with a fantastic Chicken "Under a Brick" with Braised Escarole and Crispy Prosciutto. All together, I thought this was a wine deal worth mentioning for folks in a position to take advantage. The deal is only available 'til sold out so act quickly. Tons of deals lately. What are some of your sources for the best online wine deals? Even if we can't take advantage of them in some states it's interesting to hear what's out there. Let us know in the comments.